Expect sunny skies Monday across the Rio Grande Valley, according to the National Weather Service in Brownsville. 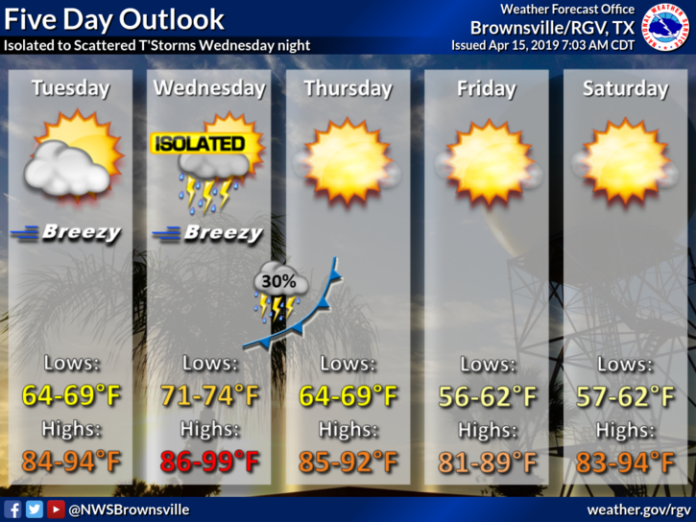 McAllen is expected to reach a high of 84, and Brownsville will be 82. South Padre Island’s high will be 78. Expect breezy conditions Tuesday and Wednesday as winds will increase out of the southeast, allowing for warmer and humid conditions. The lows on Tuesday will be in the 70s and the highs in the 80s. Wednesday lows will be in the 70s and the highs will range between 86 to 99 degrees. A weak cold front will move in Wednesday night, providing a slight chance for showers and thunderstorms. Behind the front, expect lower humidity and slightly cooler temperatures Thursday and Friday.